We’ve begun to look at our pre- and post- workshop surveys and are sharing the draft reports to stimulate conversation about our workshops and their impacts on learners. For this first cut, we looked at our post-workshop survey data. From this survey data, we can see that learning to program can be quite intimidating for many learners. 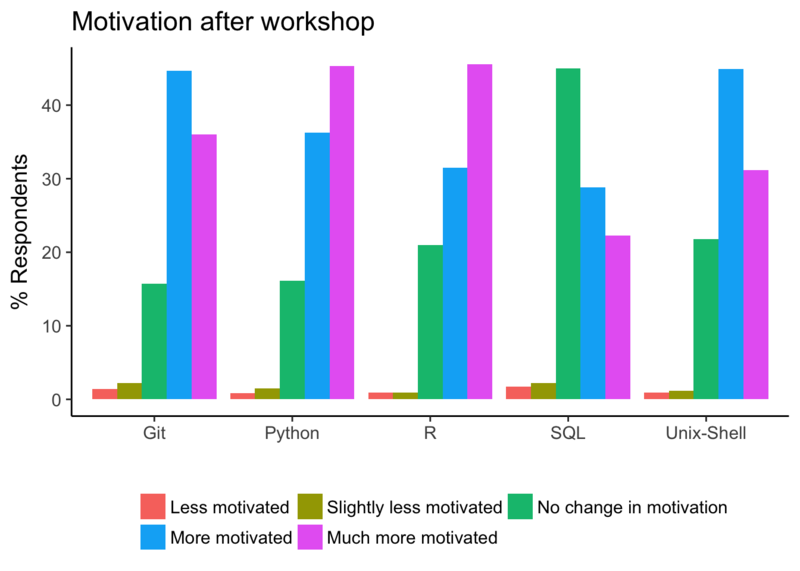 About 44.5% of Software Carpentry learners who responded to the post-workshop survey feel that at least one of the tools covered in the workshop they attended was either slightly or very intimidating to them before attending a workshop. Luckily for our learners, we have trained, enthusiastic, and considerate instructors who are great communicators. As a result, our learners are leaving Software Carpentry workshops with increased confidence and motivation to perform computing tasks like initializing a repo in Git and importing libraries in R or Python! We have learned so much from the analysis of our post-workshop surveys. We invite you to check out the Analysis of Software Carpentry’s Post-Workshop Surveys report to learn more. Special thank yous go to Ben Marwick, Naupaka Zimmerman, Erin Becker, and Jonah Duckles. These individuals made valuable contributions to the code that was used to create the figures in this report. All of the data are available in a de-identified way in this repository. Source data (csv) , Report (html) and Report Source (rmd) are all available for further analysis and exploration. We’d love to hear from you if you look at the data, and pull requests are most welcome if you come up with some interesting analyses. What strikes you after reading the report? Tweet us your thoughts @swcarpentry and @drkariljordan.